Full-HD 1080p. Continuous loop recording can record continuously when used in combination with 12V adapter and USB charging cable (Included). High-Dynamic Sensor for extraordinary light sensitivity and adaptability. One-button easy-to-use operation, or automatic on/off with engine ignition and shutdown. Micro SDHC 64GB or SDXC 128GB recommended. Cards are not included in the BikerCam package, but can be purchased from us. When fully charged and disconnected from your 12V Charger, you will still have 2. 5 hours of power remaining on the lithium ion battery. Lithium Ion Batteries are Great for Cold Weather! View, Playback and download files directly to your PC or Mac, using the included USB cable. Plug-and-play. 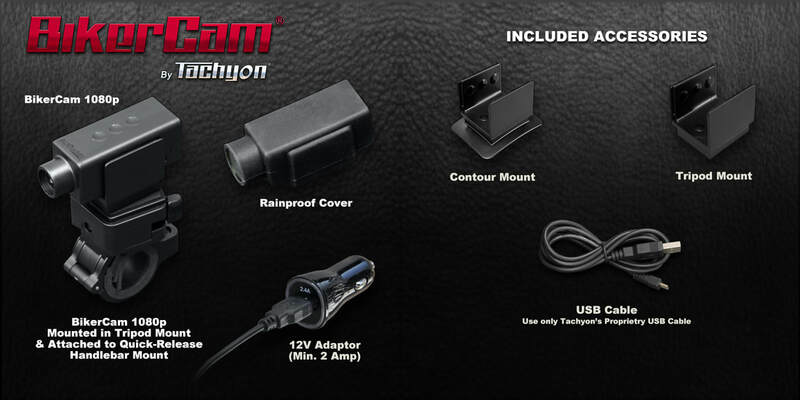 The BikerCam System, with Continuous-Loop technology, works just as well in your car, making it an ideal dash-cam.